Description: Pre-Lim is an excellent additional to any knife collector's arsenal. It works very well on damascus, carbon steels, and stainless steels to remove skin oils prior to using other products such as RenWax or camellia oil. Pre-Lim is widely used in the professional restoration of arms and armor, sculpture, brass and copper exhibition cookware, ceramics and automobile paintwork. Formulation is based on blended Neuburg silica chalks in a water/white spirit emulsion. In normal use the product is not a hazard. 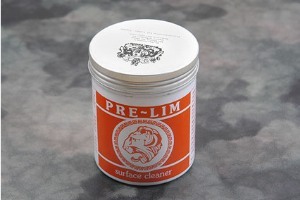 Pre-Lim's cleaning/burnishing action is achieved with extremely fine control using a soft rag and light pressure. After a few minutes of air-drying, residual chalky deposit is easily rubbed away with a clean rag, leaving surfaces dry and silk-smooth. To ensure that cleaned surfaces, especially metals, remain clean and bright, protect them with our glass-clear Renaissance micro-crystalline wax polish for a long lasting and visually enhancing finish. 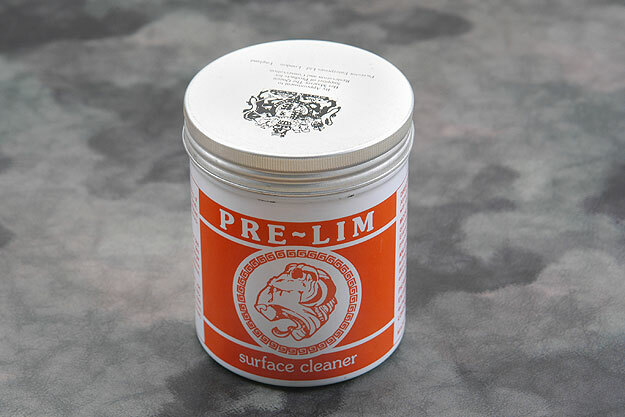 When stored in its air-tight container at room temperature or colder, Pre-Lim has an excellent shelf life. As is customary in professional restoration, a discreet test is advised to ensure that Pre-Lim is suitable for specific projects. 0.09423828125 0.09423828125 94.23828125 94.23828125 Header Started. 1.03125 0.125 1031.25 125 Trailer Started. 1.51513671875 0.48388671875 1515.13671875 483.88671875 Trailer Completed.